Giving customers what they want, when they want it, and in the quantity they want it—that’s the strategy driving a $50 million investment by Canfor in its log yard, sawmill and biomass power plant in Grande Prairie, Alberta. The upgrade has also resulted in a major change for the company’s logging contractors, who have gone from supplying tree length logs to cut-to-length (CTL) logs. Clem Luken, Grande Prairie sawmill plant manager, says that Canfor is making adjustments and investments along its entire value chain from the forest to the customer’s door to ensure it can respond to customer demands while generating a better return on investment for its shareholders. “We want to be a top quartile mill and the investments we are making here are going to make us one,” says Luken. “Our focus is on high quality at a low cost. Even in the tough times, we want to be able to make money, which is good for our shareholders, our customers, all our employees and the community.” He adds that Canfor has been part of the Grande Prairie community for many years and this investment will ensure it continues to be a big part of the community for many years to come. The sawmill will produce about 260 million board feet of lumber after completion of the project. 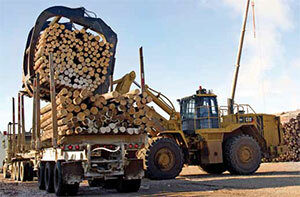 The change to CTL logs gives Canfor better process control in both the sawmill and planer mill. It also results in a better quality log delivered to the yard and cost savings—poor quality pieces that would typically have been delivered to Canfor as part of the tree length operation are now left in the bush. That change for logging contractors occurred in October 2011 and required that they make significant investment in log processing equipment as well as new truck trailer configurations to haul CTL logs. At the mill site, the $50 million has been invested in three areas. The company spent $10 million in its log yard to stabilize the ground so that it is now capable of storing 16’ and 20’ CTL logs. This was necessary after a couple of decades of debris built up on the ground from storing and transporting tree length logs using the sawmill’s recently mothballed and iconic overhead crane, which over the years had become a dominant feature of the Grande Prairie skyline. 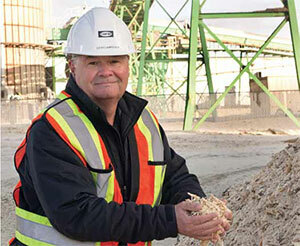 The Grande Prairie mill investment included the purchase of a biomass-fueled co-generation plant next to the sawmill. “The reason that Canfor purchased the co-gen plant is because it is a fit for where we are taking the company in the future. We are trying to reduce our energy costs,” says Dean Lawrence (left) Canfor Grande Prairie Green Energy Manager. As part of its log yard investment, Canfor purchased a refurbished Caterpillar 988 loader with an attachment capable of unloading—in one bite—a third of a B-train transporting CTL logs, and a Caterpillar M325D LMH high decker used to both unload trucks and build log decks higher. This portion of the overall investment also included an unwrapping station, scale, clean up conveyors in the sawmill, and costs associated with dismantling the overhead crane and merchandisers. The remaining $40 million was spent on a new planer mill and the purchase of a biomass-fueled co-generation plant located next to the sawmill, which was owned and operated by TransAlta Utilities. With its purchase of the power plant, Canfor is now in the power generating business, with one third of the 16 megawatts per hour generated used by the company’s facilities in Grande Prairie and the remaining two-thirds sold to the provincial grid, thus producing a new income stream for the company from what not too long ago was a waste product that was simply burned. About 85 per cent of the 132,000 oven dried tonnes of wood residuals required by the co-gen plant annually are provided by the sawmill, with the remainder coming from other operations in the region as needed. The co-gen plant also provides steam for the sawmill’s dry kilns. Located right in Grande Prairie, air emissions from the power plant are minimized by using electrostatic precipitators, and the entire two tonnes per hour of ash generated by the power plant are used as soil enrichment by an organic farmer. The 25 former TransAlta employees in charge of operating the co-gen plant are now working for Canfor. 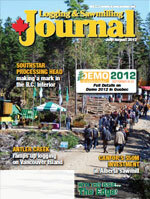 “The reason that Canfor purchased the plant is because it is a fit for where we are taking the company in the future. We are trying to reduce our energy costs,” says Dean Lawrence, Canfor green energy manager. Making the switch from tree length to cut-to-length logs, Canfor Grande Prairie purchased a new fleet of mobile equipment to unload trucks and create log decks, and retired its iconic overhead crane. The power plant was originally built by a green energy firm called Canadian Hydro Developers, which was in turn purchased by TransAlta Utilities. The planer mill investment amounts to an almost completely new facility, featuring a high speed Gilbert planer and graderless lumber grading technology provided by Comact. By this December, Luken says the sawmill expects to increase its planer mill throughput from 44,000 board feet per hour on three shifts to 65,000 board feet per hour on two shifts. Not only will the sawmill significantly increase its planer mill output, it also expects to capture an increased volume of higher grade lumber because of the installation of Comact’s GradExpert graderless technology. In addition to generating a higher volume of higher grade lumber, this technology will also allow the sawmill to expand its grade range to better meet customer requirements and potentially penetrate new markets. 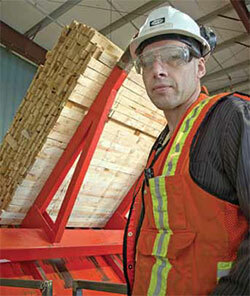 Luken stressed, however, that although Canfor Grande Prairie is making the transition to mechanized lumber grading, no one currently employed at the sawmill will lose their job, although the change is making the company more efficient. The company is reducing its required number of employees by 14 positions but will achieve that reduction largely through attrition. All told, Canfor Grande Prairie has 175 employees. 2 X 4, 2 X 6, and 2 X 10. BID Construction from Vanderhoof, B.C. is the main contractor on the planer mill project. 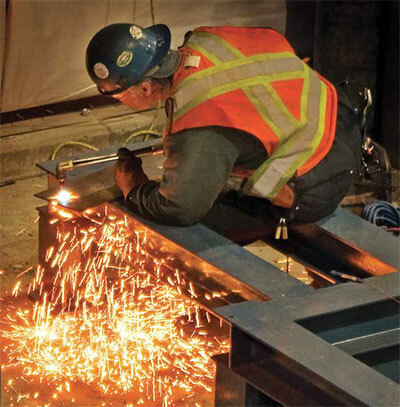 It begins with an automatic tilt hoist supplied by Northern Milltech Inc. from Prince George. This automated feature is important because the tilt hoist operator will also be responsible for feeding the planer, meaning that Canfor was able to reduce its employee complement in this area by one person. The rough, dried lumber is fed into the Gilbert, six roll, high speed planer, capable of processing 2700 board feet per minute, an improvement from the 2000 board feet per minute using the old planer. Luken says the design of the Gilbert planer requires a lot less building space, so Canfor was able to adjust its building size accordingly, and it is also considerably less susceptible to jam ups. Unlike other planers where the boards are pushed through, the Gilbert planer pulls the boards through it, leaving a small space between each board. “We believe we have purchased the best planer available out there,” says Luken. The planed lumber encounters two slow-belts on the outfeed and accumulates in a deep pile storage area, which Luken says is rather unique to Canfor planer mills. The value of this area is that if there are issues further downstream, the planer can continue to operate for a few minutes with the wood accumulating in this area. The Comact GradExpert grader can also continue to operate in case planer production stops. After a short time in storage, the lumber is then unscrambled and graded as it passes through the GradExpert unit. As the lumber is being graded, it is also machine stress rated using an acoustical system called the A-Grader transverse MSR system provided by Falcon Engineering Ltd. It is also measured for moisture content using a five-head, transverse moisture sensor system supplied by SCS Forest Products. After the grader, the lumber is processed through a Comact random length trimmer, with the capability to cut boards in two to optimize value. The lumber then splits into two lines, consisting of a 12’ and under line equipped with a stud trimmer, and a line for lumber over 12’. Both lines are equipped with bar coding and face stamping supplied by Samuel Strapping Systems. Comact was a major supplier to Canfor’s new planer mill in Grande Prairie, including the trimmer for the mill’s 12’ sort line (top of page). Canfor Grande Prairie Sawmill Plant Manager Clem Luken (left) with the automatic hoist supplied by Northern Milltech for the new planer mill. The shorter lumber is sorted into a new Comact 30 bin sorter leading into a Comact stacker and the longer lumber is sorted using the existing Newnes 60 bin sorter, which is being upgraded from a J-bar to a push-style sorter as part of this project. This lumber also leads into a Comact stacker. Although Canfor is eliminating its third planer mill shift, it is adding more personnel to its two remaining shifts to ensure that each has the personnel required. That includes the addition of two quality control employees to keep an eye on the automated grading system. “We recognize that these machines do require a lot of quality control,” says Luken. “They have to be watched because they do exactly what you tell them to do, and if you tell them to do something wrong, they do that all day long. So we have to check our lumber quite often to make sure what we are telling it is the right thing.” Canfor will be conducting a considerable amount of employee training for planer mill personnel over the next year. Last summer, the company announced that it intended to spend about $300 million in all its mills over a three year period. This investment in Grande Prairie is part of that commitment.